Harold in uniform: photo courtesy of Duncan Francis. In this period of commemoration, I thought it would be fitting to start off with stories that recognize the sacrifice made in WW1 by two young men from my local area. Harold was born in Ramsbottom on 4th August 1897. He was the eldest child of Abraham Monks and Mary Annie Mallery who had married the year before at St John's in Shuttleworth. His sister, Edith, was born just over a year later on 11th August 1898. He started at St Paul's School on 27th August 1900 aged just three years old, followed by Edith on 15th January 1901. In the 1901 census taken on Sunday 31st March, Harold was living with his parents and Edith at 7 Wallis Street, Ramsbottom. Both his parents worked at a paper mill. His father, Abraham, was a callender man whose job it was to look after the big rollers in a mill that were used to flatten the paper fibres. Mary Annie worked as a rag sorter. In 1902 Harold's brother, Robert, was born followed some time later in October 1908 by twins, Edwin and Jennie. His family was now complete, but unfortunately not for long, as little Jennie died the following year before her first birthday. By the 1911 census, Harold and his family were living at 11 Wallis Street (perhaps this was a slightly larger house or perhaps the street had been renumbered). He was thirteen and already working as a weaver. His father still had the same job at the paper mill, but his mother no longer had an occupation listed. This is perhaps not surprising, as Edwin, the surviving twin, had died aged two years shortly before the census was taken. It must have been excruciatingly painful for Mary Annie, who filled in and signed the census form, to complete the columns about the number of children born alive in the marriage and the total number surviving at that date. I hope, at least, that at this sad time she had the support of her mother and two of her sisters who lived close by in Derby Street. Patmos Church: photo courtesy of Ramsbottom Heritage Society. 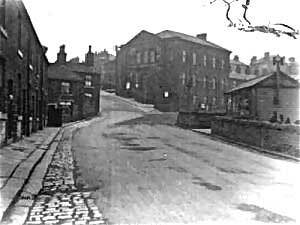 This old photograph of Ramsbottom shows Patmos Church on Peel Brow where the twins were christened and where Harold worshipped and attended Sunday school as a child. The last two houses of Wallis Street, since demolished, can just be seen jutting out on the left. So, Harold certainly did not have a long walk to church! In 1913, Ramsbottom Urban District Council started running a trolley bus service. Harold left his job as a weaver and got a job as a conductor on the new buses. This was a wonderful opportunity for the young man. As a learner conductor, he earned 18S 0d per week in 1913 and there were opportunities for promotion. In his new role, he would have become a familiar, friendly face to many local people. 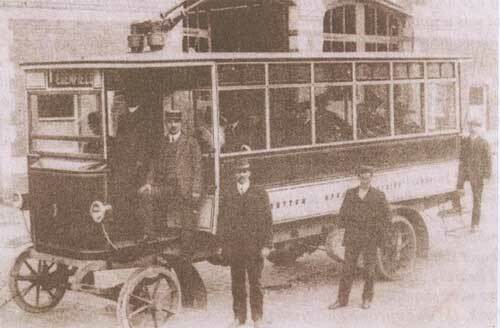 Harold would have worked on a trolley bus similar to this one: photo courtesy of Ramsbottom Heritage Society. 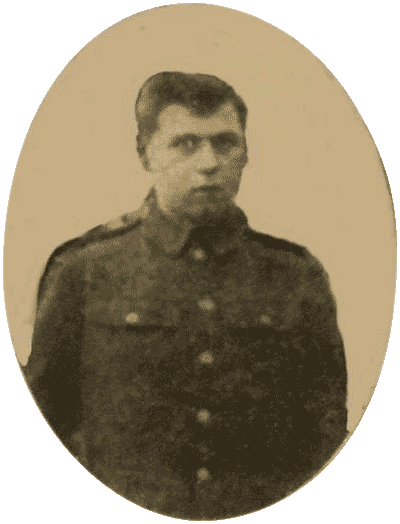 On 31st August 1914 Harold enlisted in the machine gun section of the 7th Battalion of the East Lancs Regiment. After eleven months of training, his battalion was sent to France on July 17th, 1915. Harold was involved in a number of engagements against the enemy, but ironically his death on 16th October was a result of injuries sustained when a rifle grenade burst near him when he was standing at arms. Harold was awarded two medals - the Victory Medal and the Star for his service. 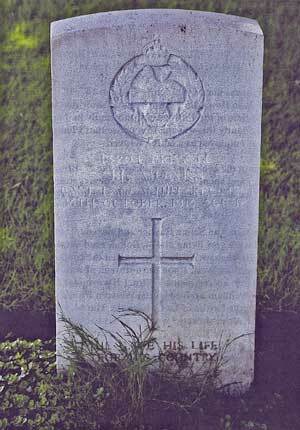 Harold's grave in Le Touret Military Cemetery, Pas de Calais, France is shown below. Harold's grave: photo courtesy of Duncan Francis. I do not know if his parents or any of his family ever visited his actual grave, but he was also commemorated locally on the Patmos Sunday School Roll of Honour and on his parents' gravestone at Park United Reform Church, Ramsbottom. Sadly, in this period of remembrance, nobody seems to know the whereabouts of the Patmos memorial and his parents' gravestone has either been removed or turned over in the graveyard. Six months after Harold's death, on the 8th April 1916, his sister Edith married Private William Howarth at Park United Reform Church. Their daughter, Mary, was born shortly afterwards. William survived the war and he and Edith went on to have at least three other children. They named their third child Harold and I like to think that this was in memory of a much-missed brother. 1The words of Lieutenant F.C.W. Taylor in the letter written to Harold's parents informing them of his death. For further information on Harold's army career and that of other Ramsbottom men, read Duncan Francis' book, Ramsbottom's Lost Generation 1914 - 1915 available from Ramsbottom Library, Carr Street, Ramsbottom or visit Ramsbottom Heritage Society's WW1 exhibition also at the library. I hope to add new stories on a regular basis, so visit my site again soon to read the next one. If you would like more information on the people featured in these stories, you can email me at cathy@familyforbears.co.uk.